Having just finished up my libnifalcon page, I decided to post a few replies on the novint forums since libnifalcon had been coming up over there too over the past month, and since they haven't sued me yet, I figure I'm ok. 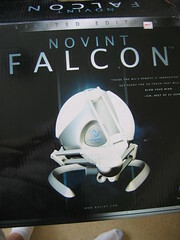 So I was picking up some Falcons at a local CompUSA closing sale ($49! 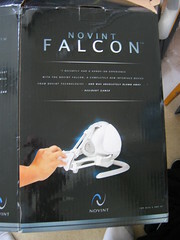 ), and while giggling to myself that I was getting falcons for cheap (now I have 3! ), a random person asked me what these large boxes I was carrying across the store awkwardly were. 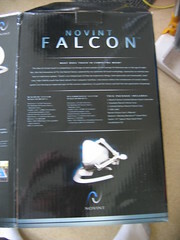 It's then that I realized: there were 5 falcons left at the store. This was the last day it was going to be open. They were $49. Not even the people picking stuff up cheap the rehawk in downtown were getting them. Not good. After setting the boxes down and trying to explain why 3 DOF haptics is important for immersion (which boiled down to "stuff like, feels, and stuff"), I realized there's nothing on the boxes to explain to anyone without some training in haptics hardware (i.e. 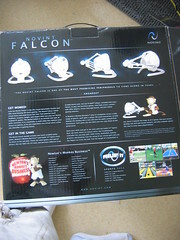 anyone without medical or industrial robotics experience) what a falcon /is/. (2) They've actually used one. The problem here is, neither of the groups can use word of mouth to convey the experience. It usually ends up in overly technical talk ("~1/800th inch encoder tick resolution per axis! "), or wild gesticulation and adjectives that don't quite fit the experience. Good for the user, bad for the uneducated customer. The choir can hardly preach to itself. Not that I have any insight on this, but the box seems to be taken up by lots of pictures of the controller itself, with no informational diagrams about how it's used. In situations where you can't have one out (which is often, since it's awful big), this might help a lot.